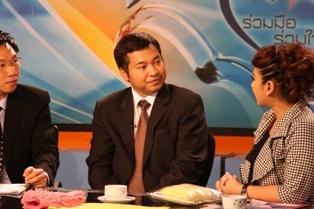 In a drive to promote consumers awareness to buying nanotechnology product such as textile, Khun Paskorn Boonsom, Director of Unsafe Product Verification and Alert Center (UPVAC) under the Office of the Consumer Protection Board (CPB) went on the air this afternoon to stress to both manufactruers and importers to comply with the consumer protection regulations and provide genuine nanotechnology product to consumers. The live interview session was conducted by Channel 11 (NBT) program “Ruam Mer, Ruam Chai” (translate: Help) at 14:00 hrs. “The UPVAC is working closely with both NANOTEC and the Nanotechnology Association of Thailand to educate the public on how they can detect genuine nanotechniology textile since for the most part is very difficult to detect by the naked eye” said Khun Paskorn. “Once the Nano Q label comes on line, this will help to encourage manufactruers to get their product tested. The Nano Q label will be produced by the Nanotechnology Association of Thailand”. Channel 9 is also confirmed to do a live interview with Prime Minister’s Office Minister Khun Ong-art Klampaiboon on March 4 at 15:00 on the same topic. A NANOTEC representative will also attend this interview session.